Save over five hours each week. Trusted by over 100,000 businesses. Build a schedule in minutes, send to the team, and manage changes easily. View your labor costs in real-time from any device. Communicate with the whole team instantly. Without texts or emails. Post to the top job boards and easily manage applicants all in one place. Drag & drop scheduling that forecasts labor costs as you go. Send to your team by text, app, and email. Track hours, breaks, and overtime from anywhere. Automatically calculate totals and identify errors. 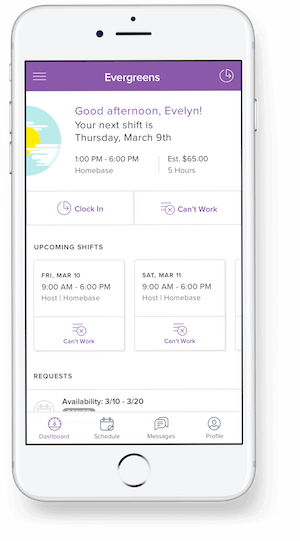 Manage shift trades, time-off requests, schedule changes and more from your phone. Post your openings for free on the top job boards or via optional paid postings with Craigslist. Sort, rate, and schedule your candidates from all sources all on one screen in your Homebase app. One mobile app for everyone on the team. Quickly and easily message your co-workers and managers—without emails or texts. Never look for a phone number again. Set up groups to stay organized, send pictures, and trade shifts easily. Build a schedule in just a few clicks, with labor costs, weather forecasts, and employee availabilities all in one place. Welcome to the digital age! Your team can clock in from any device, even your point of sale. Track employee hours and overtime automatically, even across multiple locations, from any device. View your labor costs in real-time, and easily track breaks and tips. Build job posts in minutes with custom templates and post to the top job boards in seconds. Track applicant status and, when you’re ready to hire, instantly import them into Homebase to start scheduling. Get your team connected. Enable messaging without relying on text or email. Stay compliant with local employment laws while keeping labor costs under control. Just like you, we’re obsessed with customer service. And yes, we’re human.